We are told these days not to be judgmental. Being judgmental is indeed a vice, a way of lording it over others, but the making of judgments is what life is all about – judgments about how to live, what to pursue, whom to trust, what to believe. Discernment is closely related to judgment. It is the task of distinguishing true from false, good from evil, real from illusory. It is difficult in judgments of character, of moral dilemmas, of artistic merit, and most difficult, or precarious, in approaching spiritual matters – a false prophet or true, this religion or that, a divinely prompted task or one urged by ego or desire. The literature on spiritual discernment – including such great Christian writers as St. Ignatius, Jean Gerson, and Jonathan Edwards – has been impoverished by taking it out of this larger context and treating it too narrowly – usually as a question of fidelity to a particular religion, denomination, or creed. And the Cartesian assumption that one must have criteria before testing experience is backward. It is from examining the experiences that we learn how to evaluate them, and guidelines we discover must themselves be applied with discernment. This issue became urgent for me when, though a lifelong agnostic, I heard a divine voice. The experience prompted an interest in others who had heard divine voices, such as Socrates, Saul of Tarsus, George Fox, and Joan of Arc. How did they know whether to trust their voices? Joan of Arc is particularly amenable as a case study in discernment. We have the complete records of both her trials, the one that convicted her and the Vatican retrial, which exonerated her. More than a hundred witnesses testified. Joan answered questions for hours on end, day after day, week after week. Contemporary writings debated the validity of her voices. Joan has the most thoroughly documented life of anyone in history up to her day. What can we learn about spiritual discernment from examining her case? Joan’s trial was conducted under the auspices of the English, who had captured her. They did not want merely to execute her. They wanted to discredit her, to prove that she was a heretic or, better yet, an instrument of the demonic. Denied counsel, this unschooled girl was not apprised of the arcane rules of this deadly game. For us, there are three main concerns. First, her honesty: Is Joan sincerely reporting the truth as she knows it. Does she answer questions straight? Second, her character: Is Joan reasonable, balanced, well-intentioned, and realistic. Third, her spiritual orientation: Is she serving her own spiritual hubris or is her life and attention directed, as best she can, toward God? Is she a credible witness to the divine presence? When I was thirteen years old, I had a voice from God to help me govern my conduct. Keep in mind that spiritual discernment is not a narrow topic about saints and mystics alone. Anyone might have moments where a voice, like the voice of conscience, or an inner prompt, as if from God, calms their soul or nudges them in a certain direction. The voice was sent to me by God and, after I had thrice heard this voice, I knew that it was the voice of an angel. The decisive question is not God or an angel but how did Joan know that this was a divine voice? It seems to have been the same way you know other things you see with your own eyes or hear with your own ears. You see it, you hear it, you recognize it. That is how it presents itself in experience. Sometimes you also have corroborating evidence. The voice has always guarded me well and I have always understood it clearly. This could mean that it protected her from harm, but she suffered wounds in battle and did not believe that God in any way had made her invulnerable. She had her feet on the ground in that regard. No, she means that the voice safeguarded her by guiding her, by protecting her from life’s greatest harm, which is to lose one’s soul. The questioner seems to have understood her in this way, because he then asks, “What kind of help do you say this voice has brought you for the salvation of your soul?” He is probing for something that might be objectionable to the Church, something that can be used against her. It has taught me to conduct myself well, to go habitually to church. Hard to object to that, so the prosecutor goes back to the voices. He has two questions in mind here. First, whether she is delusional, a question we would have also. Second, whether these were evil spirits, a question that may have less resonance today. St. Michael assured me of it before the [other] voices came. I knew it by his speech and by the language of the angels. I believed it soon and I was willing to believe it. Evidently, God and angels do not sound quite the way human beings sound. They sounded like angels and – this is important – she was open to believing. She did not disregard or discount the experience. The voices sounded and seemed divine, their words rang true, and she did not refuse them. St. Michael, when he came to me, told me that St. Catherine and St. Margaret would come to me and that I should act by their advice, that they were bidden to lead me in what I had to do and that I should believe in what they would say to me and that it was by God’s order. That may sound circular. One voice told her to trust other voices. But everything we know has an element of circularity in it. Experience confirms experience, reason confirms reason, morality confirms morality, one mystical experience confirms another. Then came the improbable assignment. St. Michael told me what the pitiful state the Kingdom of France was in. And that I should raise the siege of Orleans. It was in the middle of the Hundred Years War. The English had already taken Paris. Orleans was surrounded. If it went, France went. It might make sense for an illiterate village girl to receive a divine call to fast or take a pilgrimage. But to “raise the siege of Orleans”? How should the discerning observer take in such an improbable story? What does one want to know? First one would want to take the measure of the girl. Is she is a fantasizer, a fanatic, an egomaniac, a rebel? The question becomes, not how can we tell if these particular voices are “of God,” but who is Joan of Arc? Of what stuff is she made? The task is similar to that of a jury who has to decide whether a witness is credible. There is no short list of positive criteria. Instead we keep an eye out for reasons to discount her testimony. Character, in its myriad aspects, is central. Suppose we were to learn that Joan had always been uncontrollably zany, or wickedly cruel, or beset by fear and superstition, or day-dreamy, unable to live in the real world. These would be reasons, not only for us to doubt her, but for her to doubt herself. Was Joan “too” good? Others told her she was “too pious” and teased her about it. Did Joan have an excess of piety or religiosity? Perhaps, but do we hear in the testimony any note of fanaticism or pathological intensity? Not unless we think that religion should be less intense a passion than music or sports. Was Joan superstitious? Prone to believe in magic? Her prosecutors probed this question, wondering if her ring or her banner were magic charms. Those inquiries led nowhere, but there was a remarkable tree, which Joan and other young people used to garland and dance around. Quite close to Domremy, there is a tree called Ladies’ Tree, and others call it the Fairies’ Tree, near which is a spring of water; and I have heard tell that those who are sick and have the fever drink the water of this spring and ask for its waters to recover their health. I have witnessed this myself . . .
Joan is on thin ice here . . . until she finishes . . .
. . . but I do not know if it cures them or not. Legend held it that there were fairies there. However, I never heard it said that anyone had ever seen one. So, who is this girl? Like a table carved out of a single block of wood, Joan is of a piece. She is not a jig-saw contraption with gaps and loose pieces. She is at one with herself, and she does not dream to be different. She knows who she is. And the solid, straight-lined girl who is Joan knows that she can tell the difference between a good voice and a bad one. And me, I answered that I was a poor girl who knew not how to ride nor lead in war. If Joan were eager for the assignment, or had a heroic self-conception, we would worry. If she were a dreamer who built castles in the air, a young girl yearning for glory or to strike a figure, we would worry. But Joan knows quite well that she is not equipped for this task, and prefers to stay where she is. Although I would rather have remained spinning at my mother’s side, for it is not my condition, yet must I go and must I do this thing, for my Lord wills that I do so. Discernment requires looking at motives, which can be not only the self-inflation of ego and pride, but just as easily a restless spirit, a love of the theatrical, a lust for fame, or even ungrounded idealism, a desire to save the world. Joan undertook the task and, after considerable difficulty, was able to speak with the uncrowned king, the Dauphin, and tell him secrets convincing enough for him to take the next step. He sent her to be questioned by local clerics and then for further examination to Poitiers, the site of University of Paris faculty who had fled the English. She was asked to show a miracle to prove her mission. But the divine voice does not always come with signs. In God’s name, I am not come to Poitiers to make signs; but take me to Orleans, I will show you the signs for which I have been sent. It is a theological temptation to think that, if God wants something to happen, it should require no effort on our part. By God, the soldiers will do battle and God will give victory. As Joan won battles, people began an assault on her humility. They flocked to her, kneeled before her, sought blessings and healings. She had no divine powers, she replied, but would pray for them. Joan and her army liberated Orleans and took Rheims, where the king was crowned. He invited Joan to ask for a favor. Nothing for myself, but for the people of my town, permanent exemption from taxation. If Joan prayed that night, her voices might well have told her, “Joan, daughter of God, you have served faithfully and well.” Her divine mission was over. She was free to return to her village and help her mother, as she often said she wished to do. But Joan did not hang up her armor, retire her lance, and go home. She kept fighting, or trying to. Did she receive new orders from the voices? Or was Joan off on her own? And, if so, why? Had ego finally won out? Pride is one of the hazards of closeness to God. There is something awesome about the idea that the the universe, of all times past and all times future, might reach down and tap a person on the shoulder or whisper into her ear. And, if that happens dramatically and persistently, as it did to Joan, it creates a temptation to pride and self-assertion. Gandhi, whom followers had started calling “Mahatma” (literally Great Soul), once lamented, “No one knows what a burden that name has been to me.” He knew he must not give in to pride; the adulation made humility all the more difficult. 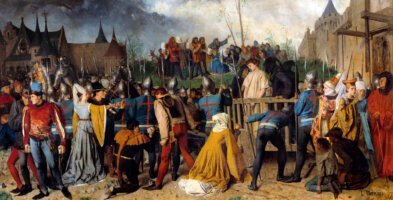 Hence, in our mission of discernment, we wonder why, on the very day of the coronation, she took it upon herself to send a message to an English ally, Philip of Burgundy, whom it was the king’s business to address, not hers. Most high and noble prince, the Maid summons you – by my sovereign Lord the King of Heaven – to make a lasting peace with the king of France. Each of you must pardon the other fully and sincerely, as loyal Christians should. She writes, not on her own authority or that of the king, but as if speaking for God. And she is not negotiating for one side; she stands astride both sides, telling them what they must do. Was this really God speaking through Joan or just Joan taking it upon herself? It is hard to tell, but it is precisely at this point that things start going wrong for Joan. This is when Joan falls into the hands of the English and is put on trial. Prosecutors ask Joan how she “summons” her voices. It is not a tame question. Evil spirits are usually called forth by charms or secret words or rituals. How did Joan summon hers? I call upon God and Our Lady that they send me counsel and comfort and thereafter they send it to me. When, suddenly, the divine is luminously present in the life of a person, there is always the question, “why me?” Or, for onlookers, “why you?” There is always the covert issue of ego. It pleased God thus to do, by a simple Maid to drive out the King’s enemies. Casting a heavy shadow over all the proceedings is the question: Does she, will she, defer to the Church’s judgment? In general, while we honor persons of conscience, we wonder if it isn’t it arrogant to place one’s own judgment above all others. There is much light everywhere, and that is very fitting. Not all light comes only to you. I abide by God who sent me, by the Holy Virgin and all the saints in paradise. And I am of the opinion that it is all one and the same thing, God and the Church, and that of that one should make no difficulty. Why do you make difficulty over that? Here Joan judges her judges. What are you really up to? The Church acknowledged the possibility of direct commands from God, which the recipient is right to obey. However, the Church is also said to be of God and has a divine mandate over the spiritual lives of its members. God outranks the Church just as the moral law outranks written law. Imagine that, in the wake of the Dred Scot case, Abraham Lincoln had been hauled before a magistrate and asked to return a runaway slave. Should he obey the court or the moral law? Taken to an extreme, neither answer is satisfactory. In theory, what could be higher than the moral law, which ideally written laws would reflect? In practice, what would be worse than an anarchy of conscience? “Do you not believe that you owe submission to God’s church on earth, that is to our lord the pope, to the cardinals, archbishops, bishops and other prelates of the church? Yes, our Lord being first served.
. . . reserving the latter judgment for herself. Take me to him and I will answer him. Joan remains firm – in refusing to disobey her voices — but not arrogant. God and her voices are not in conflict. For her, there is no issue here. I firmly believe what my voices have told me, to wit that I shall be saved, as firmly as if I were there already. Even if her voices told her she would be saved, it is dangerous to say so in court. It smacks of spiritual arrogance. This is treacherous ground, suggesting that she sees herself as so sanctified as not to be bound by the ordinary rules of morality, a temptation for both Western Gnostics and Eastern gurus. I know nothing about that, but in all things I trust God. I know not if I have sinned mortally, but if I were in mortal sin I believe that Saints Catherine and Margaret would abandon me at once. The court has to acknowledge that speaking to someone is certainly an act of which God is capable. And, if her voices are divine, then they are evidence that she has not committed grievous sins. The prosecutor puts the question in a trickier way. A “yes” answer would arrogate to herself God’s final judgment. A “no” answer would undermine the claim that her voices are divine. If I am not, may God bring me to it; if I am, may God keep me in it. I should be the most grieved woman in all the world if I knew myself to be not in the grace of God. If I were in sin, I think that the voice would not come to me. I wish that all could hear it as well as I. How does one go about the task of spiritual discernment? If the instruments at a physics laboratory suddenly reported results that contradicted all expectations, we would check to see if the gauges and measuring devices were in working order. In the case of spiritual experience, the instrument is the human person, oriented by nature to the divine pole of existence. And so, with Joan and ourselves, we examine person, character, motives, and circumstance. In so doing, we not only refine discernment; we place our lives in clearer attunement with the divine. Jerry L. Martin held held senior positions at the National Endowment for the Humanities in 1988-95, including acting chairman. From 1967-82, he a Professor of Philosophy at the University of Colorado at Boulder, where he also served as the Director of the University's Center for the Study of Values and Social Policy. He is author of God: An Autobiography, as Told to a Philosopher (Caladium, 2016) and currently is chairman emeritus of the American Council of Trustees and Alumni.